The DigitalLife Expo – one of South Africa’s largest digital technology expositions, takes place from 27 to 29 March 2009 at the Sandton Convention Centre in Johannesburg. Here a few highlights that you can expect this year. Take a walk through the Digital Home, which includes a teenage pad, children’s room, study/home office, home theatre room and entertainment room, and find out how you can integrate these new technologies into your lifestyle. Each room is packed full of the latest in digital and broadband technology. The idea is to give visitors a sense of the digital home of today and what it might be like living in one. If you do not have the abilities of King Midas you can at least get a feel of what it might be like living the most contemporary digital lifestyle. 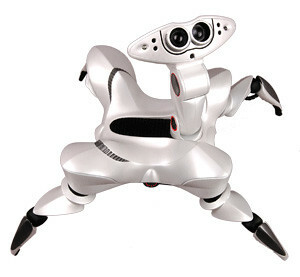 You can meet Vernon Koekemoer in person at the DigitalLife Expo, along with Wowee the Roboquad – a four-legged spider-like robot thingy that has an almost eerie sense of awareness and mobility. Literally created and launched in cyberspace, Vernon is himself a strapping example of technology in action. He’s the apparent product of a viral campaign called “Let’s make Vernon famous”, and people everywhere have taken to “the Koek” like a toothpick to biltong. If you’ve got the latest digital gear, but do you know your way around it, take advantage of free workshops and become a pro. Step into the future of mapping technology, learn more about digital photography, digital content, home entertainment, smartphone tools and broadband connectivity. Six workshops will be held daily that will not only teach enthusiasts how to use new digital technologies, but also offer tips and tricks on how to integrate existing ones into their lifestyles. DigitalLife is offering free entrance to the expo to anyone who pre-registers online for any of the workshops. Visitors to the DigitalLife Expo stand the chance of winning digital products and technologies on display in the DigitalLife Expo’s walk-through Digital Home to the value of R250 000 including security systems, a media centre, a home theatre system, digital camera, mobile phones and more. Explore the cream of the digital crop. Get to grips with the latest technology from mobile phones to notebooks, multimedia players and home entertainment systems, home-automation and digital security systems – all under one roof. Click here for a full list of exhibitors that you can expect to see this year. See it, experience it and stand a chance to win it. The first 250 people to visit the expo each day will receive a pre-release version of Microsoft’s Windows 7 operating system (believed to be the bee’s knees). Loads of hot-off-the-press digital technology products will be launched at the DigitalLife Expo, including iriver digital media players, the new T3 SecurityKey, Asus PCs and netbooks, Iomega network storage drives and Tesla’s latest home automation imports. DionWired, the consumer electronics and appliances concept store, is the expo’s official Digital Retail Store sponsor. The store will showcase its complete range of digital products and consumer-oriented services. DionWired has also developed a long list of fantastic packages and special offers available exclusively to DigitalLife Expo visitors, so be sure to visit their stand. Shopping vouchers are up for grabs every day at the DigitalLife Expo. To kick-start your digital shopping experience, ‘do Broadband’, powered by Telkom, will be giving away R5 000 shopping vouchers to visitors every day at the expo. To enter, complete the entry form to be found at the entrance to the expo and drop it off at the ‘do Broadband’ stand. PAGING through an old GQ the other day I came across a gadget that struck a new interest. The “Slingbox” (weird name) is a TV streaming device that allows you to remotely view your home cable, satellite, or personal video recorder (PVR) programming using a device with a broadband Internet connection. It connects to the back of your TV and works by redirecting or “placeshifting” up to four live audio/video signals to your personal computer, laptop, or internet-enabled mobile device whether you’re touring China or are in London on a business trip. And there’s no anxiety of having yet another gadget to clutter up your home – once your Slingbox is installed you never have to see it again. Sling Media has also released a Windows Mobile version of their player which allows users to stream their video over a Pocket PC or Windows Mobile Smartphones, or any web-enabled, Windows mobile-powered cellphone. This is useful for practical reasons as a cellphone is easier to stuff into your duffle bag when traveling to the most remote locations. The Slingbox also allows you to program your home recording device remotely, which means that you can command your device to record programs from anywhere. So no more having to phone the kids at home to ask them to record Prison Break for you, or having to rely on an unreliable in-law. Yet, like Manto Tshabalala, the Slingbox isn’t perfect. The system is not yet reliable or broadband enough to handle live remote broadcasts, and is not yet available for Linux or other opensource systems. It also requires a fair amount of techno savvy to set up, which can be a bit of a schlep, yet there is decent customer support available. SlingCommunity, for example, is an interactive online community dedicated solely to Sling Media’s Slingbox. It is, however, important to bear in mind that the viewing quality is that of web video (i.e. 320x240pixels). Consequently you basically need to have twenty-twenty vision to be able to view everything properly on the small video-viewer screen. This renders on-screen text such as sports scores, news reels, and the fine-print print in bank adverts as unreadable. The Slingbox is also only as good as its device support and relies on your primary video device being compatible. So just like upgrading a PC, you might have to buy more than you initially bargained for. In terms of future developments, it was announced at the Consumer Electronics Show that Sling Media plans to release a future feature known as Clip+Sling. This will allow users to share clips of their favorite TV shows (or videos that they have produced themselves) with each other through a hosted web service. Sling has also pledged that its software will work on the forthcoming Origami Ultramobile PCs (you can read more about this nifty gadget here). The Slingbox is currently going for $200 (roughly R1400) and appears to be a useful gadget to add to ones collection. Let’s just hope that true broadband hits SA soon so we can play too. CNET’s exclusive First Look video using Sling software.